Sharing a very hands-on post I wrote last year. 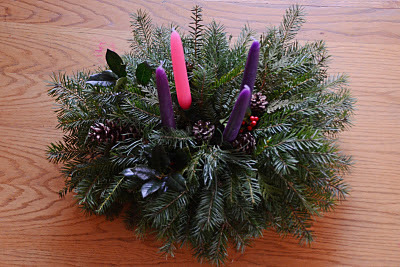 Advent is upon us and I'd like to show you how to make your very own homemade Advent centerpiece. It pretty easy and can be quite affordable, too. 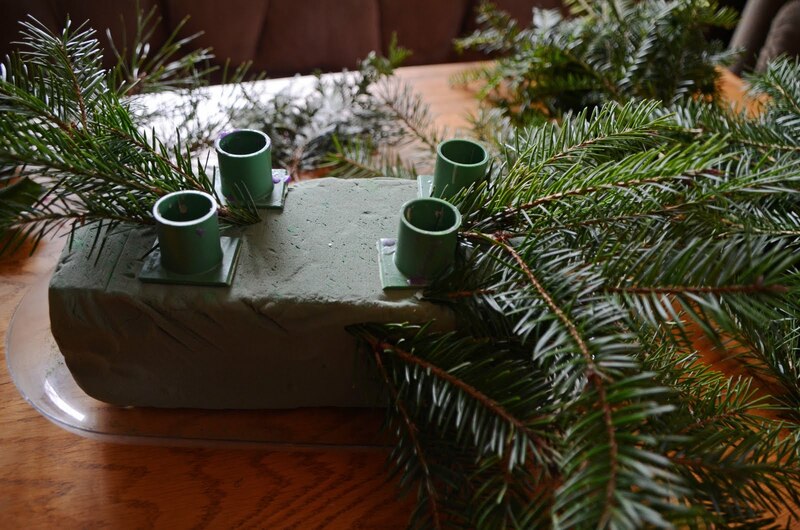 The advent "wreath" consists of 4 candles (sometimes 5) surrounded by evergreens (and whatever else you'd like to throw in there). 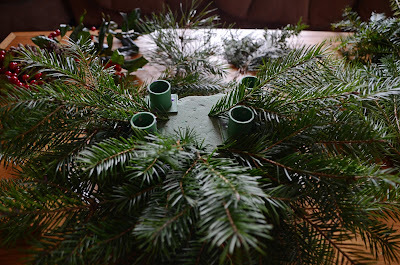 Where the wreath requires wiring the greens to a frame, the centerpiece doesn't take as much effort or supplies, but I'll still refer to it as a "wreath" because...it just sounds better. 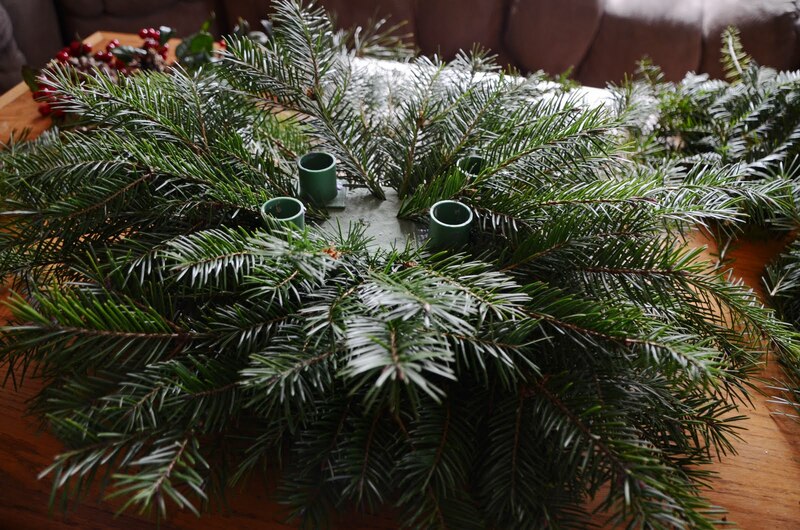 The advent "wreath" is a symbolic way to prepare your hearts and can be a fun and tangible way to get your kids involved. There are 3 purple candles and one pink. Sometimes people add a white one to light on Christmas. This is a "tradition" meaning there is no right or wrong way to include the advent "wreath". Each candle represents something, commonly the first candle lit on the 1st Sunday in Advent is purple and represents hope. 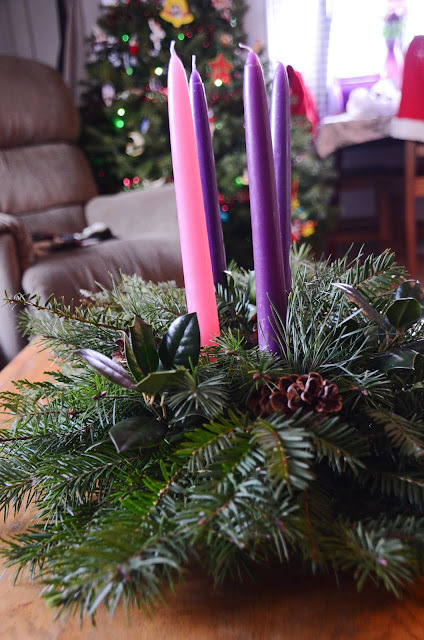 On the 2nd Sunday in Advent you light another purple candle, for love. The 3rd candle is the pink one, for joy. And the 4th candle lit is purple, for peace. The white candle, if you choose to add one, can go in the center and is lit on Christmas Day. We have enjoyed doing a family devotional along with lighting the candles. There are many out there to choose from. 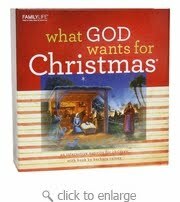 Or you can just read a little bit of the Christmas story each time and sing some Christmas songs. Like I said, there is no right or wrong way. May you have a blessed Advent season as you await and celebrate the coming of Christ, Emmanuel, Wonderful Counselor, Mighty God, Everlasting Father, the Prince of Peace. So simple! I've actually never made an advent wreath. 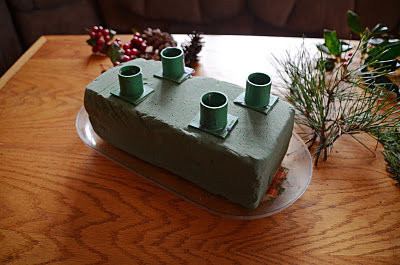 We did advent in church growing up and I've always done 25 days of advent instead of the traditional 4. Wonderful! I have done a wreath for years and used to do it this way...but my form wore out and I couldn't afford another so I've opted for a simplified version...there's a picture on my blog today..it's the "poor family's" advent wreath...$6.50 total :) Thanks for this tutorial! Glad you found this helpful! FYI, the floral foam is very inexpensive at any craft store, $1-$2. Enjoy! Thanks for sharing:) I'm going to follow your directions.